Our Client is a company that operates in the field of aluminum products for the food industry since 1936 producing pots for local and foreign markets. The production line also includes all the mechanical processing from plates to finished products. The goal to be achieved was the reduction of the disposal costs of 30 tons/days of a not-dischargeable oily wastewater and gas scrubber blowdown. Further problems and costs arose from logistics and storage of these two pollutant streams. Water containing liquid release agents coming from parts cleaning is treated with an EVALED® TC 30000. 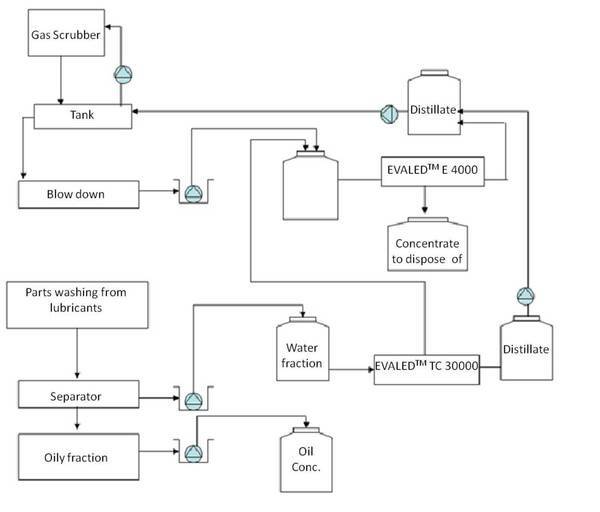 The distillate obtained, over 90% of the initial flow rate, is sent back to the gas scrubber; for a further reduction, the concentrate, once mixed with the stream coming from the gas scrubber, is sent to a second evaporator. Tale corrente viene trattata assieme ai concentrati dalla linea pressofusione con un evaporatore a bassa temperatura a pompa di calore EVALED E 4000 FF. Il distillato ottenuto, circa il 90% della portata iniziale, viene miscelato al distillato proveniente dalla pressofusione ed usato per nuovi per il make-up del sistema di abbattimento fumi ad umido. L’esiguo volume rimasto va allo smaltimento. This stream, together with the concentrate coming from the die casting process, undergoes a treatment by means of an EVALED heat pump evaporator type E 4000. The outcoming distillate, about 90% of the initial flow rate, is mixed with the distillate of the first evaporator and used for fresh gas scrubber make-up. The very small remaining volume of waste is sent to disposal. Exploitation of the separated oil as a fuel with high heat-producing power. No comments were found for Case study - Die casting wastewater treatment. Be the first to comment!